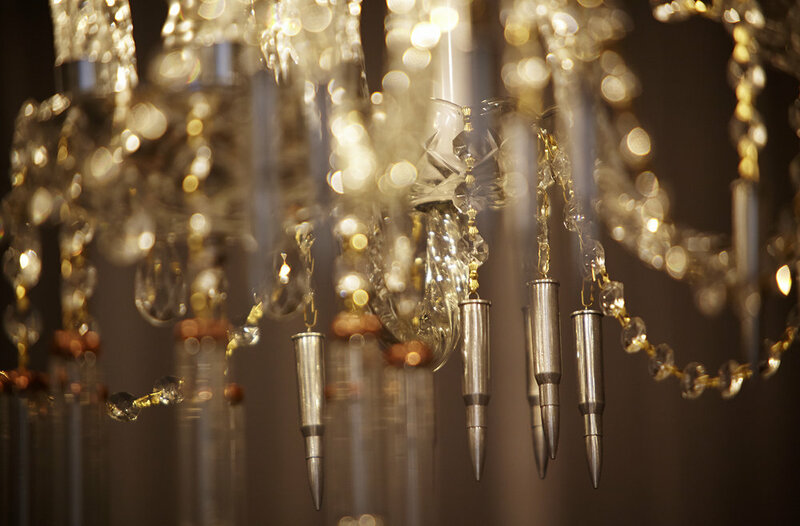 A chandelier of small metal and large 50 caliber glass bullets presents a social commentary for the viewer to experience. The auditory part of this piece is created by the fragmented rhythmic sound of moving glass and metal pieces reminiscent of some experimental sound compositions. Upon entry, the chandelier lights up and begins a steady advance towards the viewer halting inches in front of him/her, pausing momentarily then retreating back to its resting place in the darkness only to advance again until the viewer leaves. Once all movement stops, the light switches off and darkness takes over, until another viewer enters.